Denver Police Chief Robert White has agreed to be the guest of honor and speaker at City Club of Denver. This City Club event will provide the opportunity to meet our new police chief in person, to hear him set out his vision for Denver’s police force and his approach to achieving it, and for members to participate in a conversation with the key person maintaining and enhancing Denver’s public safety. Chief White has been recruited by Denver from Louisville, Kentucky, after a nationwide search. He has been specifically chosen by Denver Mayor Michael Hancock to address police brutality and behavior issues in the Denver force. “Chief White brings to Denver extensive experience in developing police-community relationships that have earned him a high level of respect nationally” said the Mayor. “I now have the needed leadership to implement my vision of restoring public trust in the police department and delivering to the people of Denver an even better police force.” Chief White’s ability to succeed in this mission was addressed by Louisville Mayor Greg Fischer: "Chief White is a high-caliber leader who has made our city safer and who has earned tremendous respect across the city. 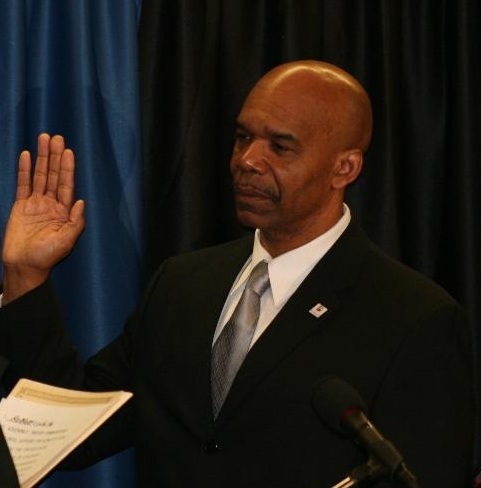 Denver is gaining a police chief of high integrity."